Observation - Mallards - UK and Ireland. 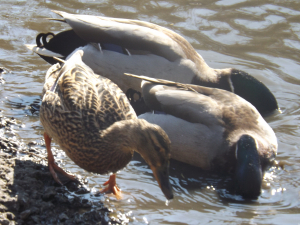 Description: Large numbers of Mallards within the Llanelli WWT site. Ratio of males to females about 2:1. Much competition between males. This female seemed to be happy to be accompanied by 2 males; they harried other males who approached her. Large numbers of Mallards within the Llanelli WWT site. Ratio of males to females about 2:1. Much competition between males. This female seemed to be happy to be accompanied by 2 males; they harried other males who approached her.